Her yaz SUFFOCATING SPURTS Massive eruptions from volcanoes, including those that produced vast lava plains known as the Siberian Traps (shown), warmed the planet and turned the oceans deadly, reducing oxygen in the water to dangerously low levels. A massive series of volcanic eruptions in Earth's distant past left ocean creatures gasping for breath. Greenhouse gases emitted by the volcanoes dramatically lowered oxygen levels in the oceans, a deadly scenario that may have been the main culprit in the Great Dying, researchers report. 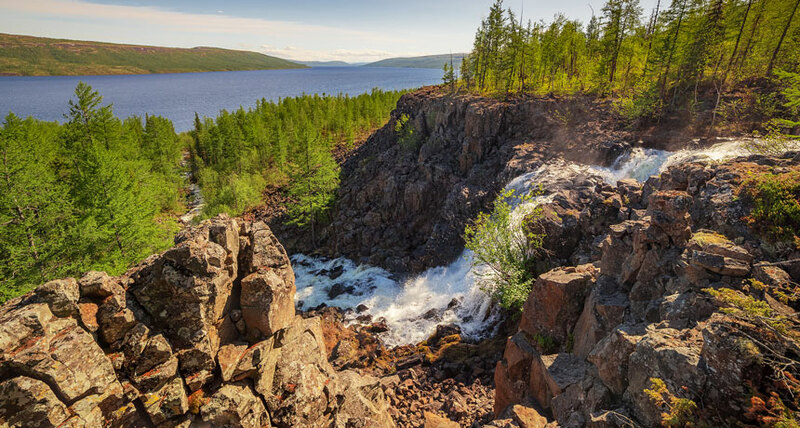 Earth scientist Justin Penn of the University of Washington in Seattle and colleagues mapped out just how hot the oceans got at the time of the greatest mass extinction on Earth, about 252 million years ago, at the end of the Permian Period. From those climate simulations, the team investigated where the hot water led to ocean anoxia, dangerously low concentrations of dissolved oxygen. Then, the team combined those data with the oxygen requirements of modern ocean dwellers. The scientists determined that hypoxia - a lack of sufficient oxygen for species' metabolic needs - could have been the primary culprit behind the die-off. The research, published in the Dec. 7 Science, also predicts that the effects of hypoxia would have been worst at polar latitudes, and available fossil data support that result. "Anoxia has been invoked as a primary kill mechanism for the marine extinctions for 20 years," says Lee Kump, a geochemist at Penn State who wrote a commentary on the finding in the same issue of Science. But what's unique about this study is the inclusion of how that anoxia affects organisms living in different ecological niches within the oceans, he says. In the Great Dying, as many as 90 percent of all marine species and 70 percent of terrestrial vertebrate species died off. Massive volcanic eruptions, discharging in pulses that began about 300,000 years before the onset of the extinction event, were almost certainly the trigger for the Great Dying (SN: 9/19/15, p. 10). But how, exactly, those eruptions led to the die-off isn't clear. There are many ways that the volcanoes could have made Earth untenable. The volcanoes emitted large bursts of carbon dioxide and methane, powerful greenhouse gases that rapidly and dramatically increased temperatures on land and sea. The eruptions may also have punched holes in the ozone layer, allowing ultraviolet radiation to blast the planet and perhaps sterilize plants on land (SN Online: 2/12/18). Oceans took the largest hit. Ocean temperatures increased at least 10 degrees Celsius at the tropics, and ocean acidification or hypoxia might have struck a killing blow for many creatures. To identify a leading culprit, Penn and his colleagues decided to take a look at the animals themselves. Or rather, at modern stand-ins for long-extinct species. The team determined where in the ocean oxygen supply would have fallen below oxygen demand - for feeding, reproduction and defense - for various creatures. The tropics suffered, the researchers found, but many species there have adaptations that enable them to survive warming waters and lower-oxygen conditions. The worst of the death toll from lack of oxygen would have happened at high latitudes, where creatures have no such adaptations, and have nowhere to go.